As we head into the first week of July, it’s hard to believe it is “summer”. Despite the heavy outbursts of showers more typical of April, visitors are not deterred by the weather to explore Inishowen from the continent. Statistics from the January to May period 2015 have been assessed in relation to the same period this year 2016. Although it doesn’t give an overall picture until the end of the year, early indications show there is a steady increase in visitor numbers from the main overseas markets that include the UK mainland, 9% increase since 2015, Germany, up by just 1%, France by 5.5%, and remarkably an increase by 50% in Italy. The Republic of Ireland domestic market was up 3.5%; however there was no increase in the Northern Ireland visitor statistics in contrast to last year compared to 2014. It is expected that this may spike upwards during the July/August period as it historically hits the main holiday months. Up and coming markets like Australia were showing increases of 36%, with various visitors from the category Others up by 29%. 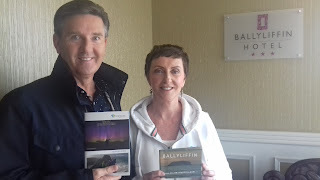 Our very own celebrity that has put Donegal on the map all over the globe stopped by The Ballyliffin Hotel for a well deserved break in filming his road trip series; Just in case he needed to know “what to see and explore” the all important Inishowen Visitor Guide 2016 was at hand from the staff at the hotel. We have welcomed International journalists in the past weeks to highlight all that Inishowen has to offer in collaboration with Failte Ireland. This week Inishowen Tourism was invited to join a large group of International photographers to a special event organised by Brendan Diver (Photos from Ireland). A Welcome Evening of music and networking started on Sunday 3rd of July with various workshop locations planned for the week to include authentic photography experiences hosted by world renowned photographer Elena Shumilova. Brendan Diver organiser and local photographer stated “I’m delighted to have the 2nd workshop here in the Inishowen Peninsula with such a talented host, Elena and forty two participants from all over Ireland, the UK, Norway, South Africa, Cayman Islands, Peru, Singapore, Georgia, Sweden and Finland”. We look forward to seeing the images this week and sharing their experiences through the lens via multimedia channels. Here’s hoping the weather picks up and the sun shines for our visitors just a little while to enjoy our beautiful Peninsula.